Spreadtrum, the chipset company has announced the launch of its first octa-core LTE SoC, supporting Artificial Intelligence applications- the Spreadtrum SC9863. The highlight of this new chipset is it’s solely built on the Cortex A55 architecture. In the past, we have seen the Cortex A55 architecture in chipsets such as Snapdragon 450, Snapdragon 625 and so on, but they were paired with high-efficiency cores from the Cortex A7 series, but the Spreadtrum SC9863 comes with just Cortex A55 architecture. It’s an octa-core chipset with all the cores clocked at 1.6GHz. Also, the chipset supports dual 4G functionality. Spreadtrum says when compared with the Arm Cortex A53, the performance of the Spreadtrum SC9863 is improved by 20% and AI processing power is increased by six times. 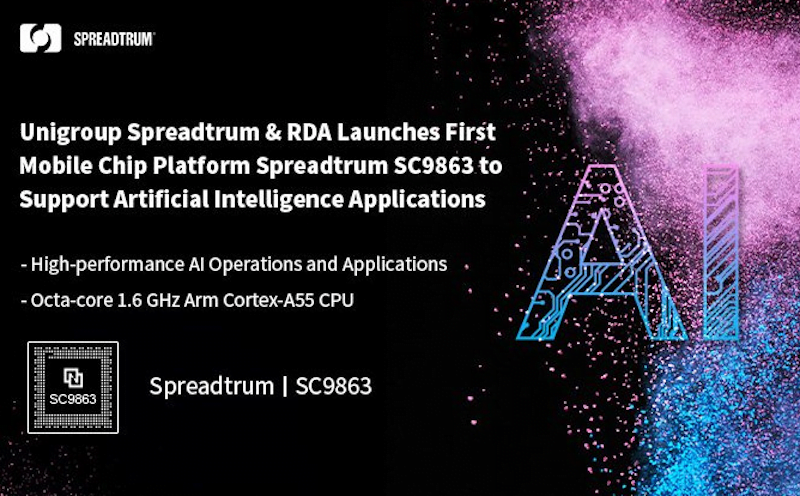 Through its intelligent AI algorithm, the Spreadtrum SC9863 SoC can achieve real-time intelligent context detection and recognition, simultaneously enhancing the phone’s ability to take smart photos and supporting the intelligent identification and classification of images in the photo gallery said Spreadtrum in a press statement. In addition, Spreadtrum SC9863 supports face recognition technology based on deep neural networks, which in turn might result in fast, accurate face authentication. Furthermore, the new chipset also brings improvements to cameras. The chipset has support for dual ISP, dual cameras of up to 16MP, real-time bokeh effect, background replacement, dark light enhancement and real-time beautification. The chipset also has support for 1080p video playback, and yes, it even supports Full HD+ screen displays. Moving onto the crucial part, the Spreadtrum SC9863 supports five-mode full-band LTE Category 7 (Cat 7) communication, as well as Carrier Aggregation and TDD/FDD hybrid networking, in addition to offering dual-card dual-VoLTE and VoWiFi functionality. Spreadtrum is yet to reveal when the SC9863 will be available for smartphone manufacturers. Dual 4G is something very crucial in 2018 and Spreadtrum has introduced it with its new chipset. We can see the Spreadtrum SC9863 in the upcoming sub Rs 10,000 smartphones. A55 chips like 450 and 625? Wrong! Both 450 and 625 use the A53. Snapdragon 460 uses A55, 640 also uses A55, but that chip also has A75 cores. When were SD460 and SD640 released? Yes, they haven’t been released yet. 640, and 670 were supposed to be given the A55, A75 combo, but QC decided to scrap 670 and make it 710. Dunno about 640 and 460. What do you think? Will P70 be released this year?? ?